“We are finding that once such water flow is initiated through a new section of ice sheet, it can warm rather significantly and quickly, sometimes in just 10 years, ” said lead author Thomas Phillips, a research scientist with Cooperative Institute for Research in Environmental Sciences. CIRES is a joint institute between CU-Boulder and the National Oceanic and Atmospheric Administration. Conventional thermal models of ice sheets do not factor in the presence of water within the ice sheet as a warming agent, but instead use models that primarily consider ice-sheet heating by warmer air on the ice sheet surface. In water’s absence, ice warms slowly in response to the increased surface temperatures from climate change, often requiring centuries to millennia to happen. That may be so, but even if the ice doesn’t disappear, our coastal cities will be under 20 feet of sea water. To quantify the influence of melt water, the scientists modeled what would happen to the ice sheet temperature if water flowed through it for eight weeks every summer — about the length of the active melt season. The result was a significantly faster-than-expected increase in ice sheet warming, which could take place on the order of years to decades depending on the spacing of crevasses and other “pipes” that bring warmer water into the ice sheet in summer. “The key difference between our model and previous models is that we include heat exchange between water flowing through the ice sheet and the ice,” said Rajaram. Several factors contributed to the warming and resulting acceleration of ice flow, including the fact that flowing water into the ice sheets can stay in liquid form even through the winter, slowing seasonal cooling. In addition, warmer ice sheets are more susceptible to increases of water flow, including the basal lubrication of ice that allows ice to flow more readily on bedrock. A third factor is melt water cascading downward into the ice, which warms the surrounding ice. In this process the water can refreeze, creating additional cracks in the more vulnerable warm ice, according to the study. So the next time you have an opportunity to pee on ice, don’t be surprised if it reminds you of our world’s polar ice melt catastrophe. “We now estimate the deposits contain over 1.5 trillion tons of frozen carbon, about twice as much carbon as contained in the atmosphere”, said Dr. Charles Tarnocai, Agriculture and Agri-Food Canada, Ottawa, and lead author. So the fact that the permafrost is now permamelt becomes a concern truly second to none. More worrying still is that the melting is not the product of a single amplifying feedback but, at a minimum, a tag team of three feedbacks each reinforcing each other while attacking from different angles: Land, Sea and Air. There is a comprehensive and devastating attack underway on the permafrost that would make General William Tecumseh Sherman proud. The fire that raged north of Alaska’s Brooks mountain range in 2007 left a 1000-square-kilometre scorched patch of earth – an area larger than the sum of all known fires on Alaska’s North Slope since 1950. Now scientists studying the ecological impact of the fire report that the blaze dumped 1.3 million tonnes of carbon dioxide into the atmosphere – about the amount that Barbados puts out in a year. What’s more, at next week’s meeting of the Ecological Society of America in Albuquerque, New Mexico, two teams will warn that as climate change takes hold tundra fires across the Arctic will become more frequent. 1. It transforms the tundra, traditionally a carbon sink, into an carbon emitter. 2. More importantly it radically increases the ground’s solar absorption. The really big problem: The burnt tundra – a newly minted solar heat collector – is sitting on the permafrost. Helping drive the Tundra fires is the air assault. The average surface air temperature warming in the arctic has been many times greater than Earth’s average warming. The warming is concentrated where it can likely do the most damage. Autumn temperatures are at a record 5º C above normal, due to the major loss of sea ice in recent years which allows more solar heating of the ocean. Winter and springtime temperatures remain relatively warm over the entire Arctic, in contrast to the 20th century and consistent with an emerging global warming influence. As the excerpt states the feedbacks are reinforcing each other. On to the the sea attack. Permafrost threatened by rapid melt of Arctic sea ice – reported the American Geophysical Union in 2008. The team finds that, during episodes of rapid sea-ice loss, the rate of Arctic land warming is 3.5 times greater than the average 21st century warming rates predicted in global climate models. While this warming is largest over the ocean, the simulations suggest that it can penetrate as far as 1500 kilometers (about 900 miles) inland. The simulations also indicate that the warming acceleration during such events is especially pronounced in autumn. The decade during which a rapid sea-ice loss event occurs could see autumn temperatures warm by as much as 5 degrees C (9 degrees F) along the Arctic coasts of Russia, Alaska, and Canada. What’s to worry about? It’s not like we’ve been losing all that much sea ice – NOT. The rapidly melting Arctic permafrost is now our biggest existential threat – as it was the Soviet ICBMs raining down from the Arctic circle we so feared growing up. And while we and the Soviets were restrained by self-interest, the hard-charging feedbacks have no such restraints. We must restrain the feedbacks. Methane: the other green house gas, is 20 to 25 times more potent than CO2 (depending on who you ask). The good news was that over the last decade methane releases have been largely flat due to reductions in man-made emissions. Unfortunately the good news is old news. NOAA has just released a report today titled “Carbon Dioxide, Methane Rise Sharply in 2007”. Rapidly growing industrialization in Asia and rising wetland emissions in the Arctic and tropics are the most likely causes of the recent methane increase, said scientist Ed Dlugokencky from NOAA’s Earth System Research Laboratory. As I discussed previously in “The Awakening Great White Whale”, the arctic permafrost is the place to look for the most critical planetary tipping point. Spiegel Online has a frightening confirmation of what we face with further warming in just the next few years. What treachery lies in the permafrost? In the permafrost bottom of the 200-meter-deep sea, enormous stores of gas hydrates lie dormant in mighty frozen layers of sediment. The carbon content of the ice-and-methane mixture here is estimated at 540 billion tons. “This submarine hydrate was considered stable until now,” says the Russian biogeochemist Natalia Shakhova, currently a guest scientist at the University of Alaska in Fairbanks who is also a member of the Pacific Institute of Geography at the Russian Academy of Sciences in Vladivostok. The permafrost has grown porous, says Shakhova, and already the shelf sea has become “a source of methane passing into the atmosphere.” The Russian scientists have estimated what might happen when this Siberian permafrost-seal thaws completely and all the stored gas escapes. They believe the methane content of the planet’s atmosphere would increase twelvefold. “The result would be catastrophic global warming,” say the scientists. The greenhouse-gas potential of methane is 20 times that of carbon dioxide, as measured by the effects of a single molecule. Climate change could give an additional push to these trends. “If the Arctic Sea ice continues to recede and the shelf becomes ice-free for extended periods, then the water in these flat areas will get much warmer,” said Overduin. That could lead to a situation in which the temperature of the sea sediment rises above freezing, which would thaw the permafrost. 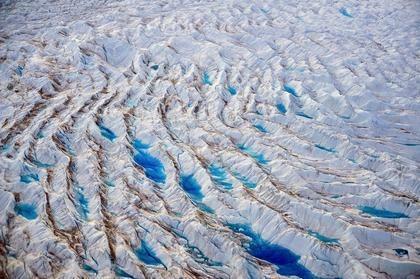 The $64,000 question is what’s the rate of acceleration of the permafrost melt? If we don’t slam on the CO2 brakes hard and now, this war for survival could be over before we’ve even started to fight. While climate change is effecting every spot on the planet and the most visible effects are the crumbling ice shelves at both poles – perhaps the most important and critical early warning signs are the borreal forests and permafrost stretching like a collar around the top of the earth. There is new evidence of the borreal forests’ warming. With the latest readings from NOAA (look particularly at the graph showing the biggest temperature rises over the Siberian forest.) it is another concrete Clarion call to action. It seems that the melting permafrost has likely got a one way ticket for the foreseeable future – that is until we can turn our CO2 spewing boat around. Our future may be defined by the simple calculation of how fast the permafrost is going to melt – and like Hansen’s 350, another number may come to haunt us: 500. That’s the over 500 billion metric tons of carbon that the permafrost is estimated to hold. To make matters worse the carbon is generally being released as methane, at an ever increasing rate. While methane is over 21 times more potent than CO2, the good news is that methane dissipates 10 times faster as CO2. So the BIG question is how fast is the melting accelerating? It could disastrously add the right push to make this climate crisis a perfect storm – and there’s only one boat. While the Olympics and election are sure to drown out important climate news keep your eyes out for reports on the permafrost melt this summer and what new projections foresee. If such a thing is possible, the data readings this summer could be our most important warning to date. Iraq, health care, the economy – all important issues. And all are a diversion from the one true crisis we face. For if we don’t solve the global warming crisis all other important issues will cease to be, period. An article by Joseph Romm, “Obama and Clinton plan to cool it” takes a look at Hillary and Barack and climate change. The gravest threat to the American way of life is posed by unrestricted greenhouse gas (GHG) emissions. Global warming threatens to put the Southwest into a permanent drought, raise sea levels by 6 or more inches a decade, generate hundreds of millions of environmental refugees at home and abroad, wipe out half the planet’s species, and increase average temperatures in the nation’s interior 10-20 degrees Fahrenheit. And these impacts would likely get steadily worse for hundreds of years or longer. Unfortunately, Mr. Romm then goes on to talk about the crisis as if it’s about to happen rather than saying it’s happening. Humanity’s great challenge is to stop the warming before we cross key thresholds or tipping points, in which amplifying feedbacks in the carbon cycle start to seriously kick in and overwhelm human efforts to reduce emissions. A typical feedback would be the melting of the permafrost or tundra, which currently has locked away some 1,000 gigatons of carbon — more carbon than the atmosphere is holding today. Tipping points are being crossed now. The permafrost is melting now. The acidification of the ocean is happening now. Mr. Romm rightly notes that both Obama and Clinton have relatively strong and detailed positions (if inadequate) on global warming. While supporting McCain at this point is best described (by me, not Mr. Romm) as a suicide pact. May I tip my hand here, and say that, while a narrow and fleeting look at the candidate regarding this issue, it’s stuff like this that gives me some confidence there’s “can do” substance backing up Obama’s rhetoric – and that perhaps he appreciates the climate crisis is much, much worse than most of us realize. If we’re to take a serious shot at saving the planet we inhabit, it’ll take leadership that’s willing to leapfrog ahead and change the game. And lastly (and not completely unrelated), may I suggest downloading the Checklist Toward Zero Carbon. While our leaders leapfrog, so must we. Compost: a weapon of mass destruction? Oh Canada, say it ain’t so!